Comfort and privacy are probably the two most important factors to consider when flying. First and Business classes provide both as well as other amenities and luxuries that help alleviate the stresses of air travel. However, each class provides them in varying degrees and can depend on the airline, route and aircraft model. It may be that business class seats will suffice on an eight-hour journey, or perhaps you can’t imagine flying for 15 hours if you’re not in your own private suite? Whatever your preference, it’s beneficial to look into the biggest differences between first class and business class before you purchase a ticket to ensure you attain your preferences. (Note: For our purposes here, we will discuss only international, long-haul services). As a first class guest, you are first for everything. You have priority over every aspect of travel; transfers, check-in with never any queues, security clearing, boarding and disembarking, meal times and luggage collection. There’s even talk that airlines carrying a high proportion of first class passengers be given landing priority (don’t get too excited yet, these are still just plans). There are so many ‘firsts’ built into travelling in first class over business class. If you never know what to pack and end up taking everything, then first class travel is the only option for you, with a massive luggage allowance of up to 70 kg (154 lbs) for checked bags on some airlines. In addition, purchased first class fares get you more points than miles, which means you reach a higher status faster with fewer flights. On-board, you can enjoy stress-free productivity being completely separated from other cabins – some airlines, particularly on an A380, dedicate the entire upper deck to premium classes. This gives you the feeling of flying on a private jet rather than on a commercial flight. If your itinerary requires an overnight transfer at a destination, a first class service will often provide two nights complimentary hotel stay whereas in business class, the minimum requirement is just one night. Should any incident occur during your journey (a missed flight for example) a first class service will do everything necessary to resolve the situation and even enhance it further (offering complimentary nights accommodation, concert tickets and other perks). For leading airlines, the premium experience begins before you even take off, on the ground, before check-in. As a first and business class passenger, this means extradited check-in and boarding. First class ground services can be truly impressive. It could mean, as with Lufthansa, skipping the main terminal altogether (in Frankfurt) and being in an exclusive terminal instead, thereby avoiding the usual hassles associated with airports. Lufthansa then drives you to your plane in a Porsche or Mercedes. Air France offers a similar service and throws in a spa treatment and Michelin star restaurant in the First Class Lounge (from Paris). While business class services don’t provide a drive to your aircraft, it does offer luxuries that will shelter you from the hustle and bustle of major airports, providing an oasis to relax and prepare for your long-haul flight. Qatar Airways’ Al Mourjan Lounge in Doha, for example, has created a space that’s more like a five-star boutique hotel with expansive spaces and extravagant features like the 15x7m infinity pool water feature. Virgin Atlantic’s Clubhouse in London Heathrow includes a cinema, a gaming room with arcade games and pool table, a Sky Lounge and an outdoor terrace. Need to catch up on some beauty sleep pre-flight? First class lounges have you covered here, with sleeping rooms provided like those at the Air China/ Star Alliance First Class Lounge in Shanghai. And who doesn’t need a spa experience before jetting off across the globe? At Qantas’ First Class Lounge in Sydney and Melbourne, you can indulge in a pampering session in the day spa amidst lush foliage. There is a menu of massages you can choose from as well as a range of treatments available. Privacy is also highlighted in first class lounges with many airlines offering added privacy suites and quiet enclaves where you can carry out work well away from prying eyes. In addition, first class lounges are an oasis in busy international airports and very rarely get crowded, as can sometimes be the case in some business class lounges. 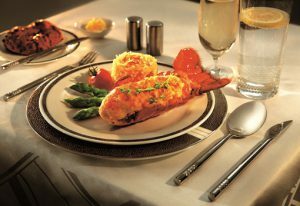 When it comes to pre-flight dining, you probably will never look back after a first class experience. A meal in Qatar Airways’ First Class Lounge in London Heathrow doesn’t confine your taste buds to a menu. Instead, it allows you to choose from a wide-range of organic and international ingredients from the Delicatessen for the chefs to create what you fancy instantly. Once you’re on your flight and found your seat or suite (whatever may be the case), the most important resource you look for is space and how much of it you have to yourself. This is probably where the biggest difference between first class and business class lies on international, long haul flights. Business class nowadays has become the battleground for airlines vying for high-flyers and well-heeled corporate travellers and are constantly pushing the envelope to produce products that could have you questioning if first class really is a necessary luxury. Emirates business class on the A380, for instance, gives you your own, personal mini bar at your seat. 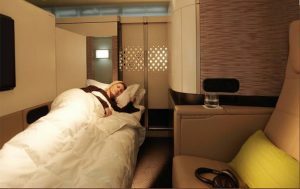 Many airlines, like Qantas and Air Canada, offer pods for extra privacy with seats that transform into a fully-flat bed that measures around the 6-foot mark. But if space really is your be-all and end-all of air travel, then you will not go pass some of the first class options available on some airlines. 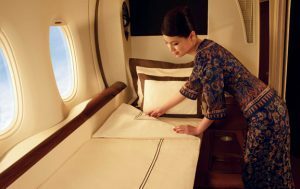 We’re talking double beds (Singapore Airlines) of the fully flat variety, or even your own apartment in the sky (Etihad) containing a seat and a bed in your own private suite with sliding doors to boot! This is where first class will come up trumps every time because, as we’ve just mentioned, many airlines offer private suites. More over, there is usually just a hand full of seats in first class cabins, meaning there are less people travelling in the cabin with you and conversely, less people walking up and down the aisle (just a single aisle in first class) or visiting the lavatories. You can really keep to yourself and almost feel like you’re flying on you very own private jet. When you’re paying premium prices, every little thing matters. You want to feel like you’re having an experience rather than being just a number in an assembly line. How much attention you are paid on a flight is one of the main reasons you choose to fly at the pointy end of the plane in the first place. There are some clear differences in first class vs business class. If you’re the type to hop on board and get on with work or maximise your sleep with minimum interruption, then business class will serve its purpose. Many airlines, like British Airways, even have a World Sleeper Service (on selected flights) where they will leave you undisturbed for most of your flight should you request it. Other airlines offer unique services like a flying Nanny (Etihad) if you’re travelling with the family, and quite a few airlines these days boast flying chefs in their business class (Turkish Airlines is one), serving restaurant-quality cuisine face-to-face. But if personalized, proactive service is what you live for in your travels, then first class on many of the prominent airlines will never leave you wanting. There are more flight attendants per passenger in first class and they are highly trained to anticipate your every flying need. You can enjoy plenty of complimentary food and alcoholic beverages in both first and business class cabins. And both cabins often offer seasonal cuisine from a particular airline’s region with the preparation overlooked by renowned chefs. Flying in business class allows you to dabble in restaurant-style dining. This can be sampled on the likes of Korean Air, which offers the freshest and healthiest food in the skies, hailing its organic food programme from the pastures of Jeju Island, whilst Austrian Airlines employ on board sommeliers to advise guests of the best food and wine pairing. In first class, you can expect nothing less than a five-star dining experience, complete with China tableware and fine table linen. Air France does fine-dining very well with award-winning menus designed by Michelin-starred chefs, such as Daniel Boulud. Meanwhile Singapore Airlines serves both Krug Grande Cuvée and Dom Perignon 2004 with caviar as well as lobster thermidor. We’re sure you’d agree that these are necessary luxuries!